In an outright assault on public health and the environment, the Trump Administration recently proposed rolling back national motor vehicle emission standards put in place by the Obama Administration. As part of this proposal, the Trump Administration also took aim at a special provision long-enshrined in the federal Clean Air Act allowing California to set its own motor vehicle standards--a provision that has resulted in tremendous environmental benefits and been a textbook success story for cooperative federalism. In a new Issue Brief published with the American Constitution Society today, we outline why we believe this unprecedented move is legally indefensible and environmentally catastrophic. To fully understand the significance of the Trump Administration’s attack, one has to take a quick trip back to 1940s Los Angeles. Angelenos were faced with inexplicable attacks of “eye-irritating haze, accompanied by a peculiar ‘bleaching-solution’ odor.” Los Angeles County reacted by forming the nation’s first Air Pollution Control District, and focused on reducing pollution from local industrial sources like petroleum refineries and rubber plants. 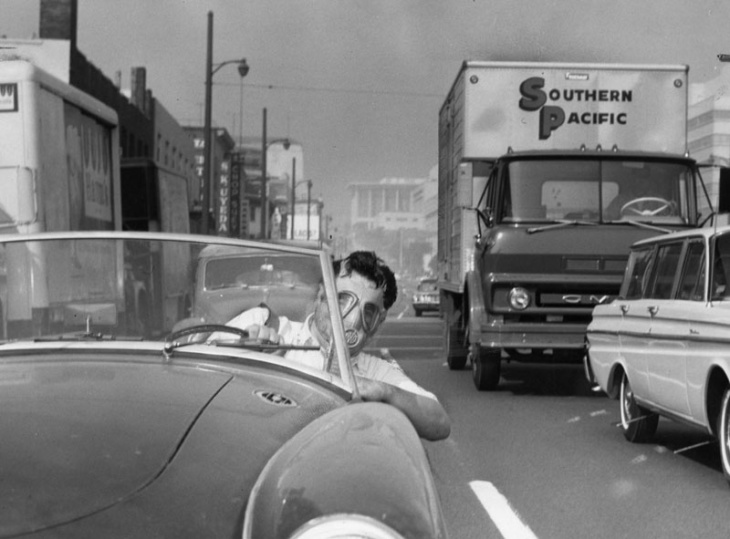 But in the early 1950s, CalTech chemist Dr. Arie Jan Haagen-Smit realized the accumulation of what we now term “smog” was actually the result of emissions from motor vehicles reacting with Southern California’s sunshine to form ground-level ozone trapped by the surrounding mountains. So in 1960, California formed the Motor Vehicle Control Board and began regulating motor vehicle emissions by setting tailpipe standards limiting the pollution cars were allowed to emit. California set strict new public health-based standards that could only be met through the development of new technology like the now-omnipresent catalytic converter. Meanwhile, Congress was under pressure from automakers to head off a patchwork of 50 different vehicle standards. So in the 1970 Clean Air Act amendments that created our modern air quality regulations, Congress included an express preemption clause barring states from setting their own vehicle standards. But, recognizing both California’s policy leadership and its particular problems with smog caused by vehicles, Congress included a carve-out for the state. Still enshrined in the Clean Air Act today, this special exemption allows California to issue its own standards as long as it seeks a federal preemption “waiver” from the Environmental Protection Agency (EPA). So long as California’s standards protect public health and welfare at least as strictly as federal law, and are necessary “to meet compelling and extraordinary conditions,” the law requires EPA to grant California’s request for a preemption waiver. Each time California adopts new standards, the state applies to EPA for a federal preemption waiver for those standards. Since 1970, California has been granted more than 100 waivers for each iteration of its motor vehicle standards. And the EPA has typically responded by adopting California’s standards at the federal level once California has successfully demonstrated their achievability at the state level. This cooperative and iterative federalism relationship has resulted in emissions reductions beyond what either California or the EPA could have achieved on its own. New passenger vehicles are 99% cleaner today than when first regulated back in the 1960s. And regulating tailpipe emissions has more than paid for itself--the federal government estimates that every dollar spent to reduce emissions from vehicles results in nine dollars in benefits to public health, the environment, productivity, and consumer savings. So now we come to August 2018, when the Trump Administration proposed rolling back harmonized fuel economy and greenhouse gas tailpipe standards agreed upon by both California and the federal government back in 2012, freezing the standards at 2020 levels instead of continuing to ratchet down through the 2025 model year. Ignoring the successful history described above, the Trump Administration also seeks to revoke California’s waiver to set their own standards--attempting to lock California into the proposed weakened federal standards. Such a revocation is completely unprecedented. Under George W. Bush, the EPA once denied a request for a waiver (and even that was later reversed by the Obama Administration)--but the EPA has never revoked a waiver once it has already been granted to California. As we detail in the Issue Brief published today, not only does revoking California’s waiver fly in the face of federalism principles and threaten the tremendous environmental progress made over the past five decades, we believe revoking the waiver is also legally indefensible for three primary reasons. First, the Clean Air Act does not provide EPA with the authority to revoke a waiver; it allows EPA to grant or deny a waiver but not to revoke one. Second, California’s waiver continues to satisfy all requirements of the Clean Air Act provisions guiding when EPA should grant a waiver request. Revocation of California’s waiver would ignore the “compelling and extraordinary” conditions that have supported California’s waiver in the past, conditions which, if anything, have become even more compelling. Finally, though the Trump Administration argues that California’s greenhouse gas tailpipe standards are preempted by the federal Department of Transportation’s authority to issue fuel economy standards, there is virtually no support for this position. Multiple federal courts have already rejected this argument in earlier challenges to California’s first tailpipe standards, and these arguments are no more convincing now than when they were rebuffed in 2008. The proposed rule issued last August is still just that--a proposal. A final rule was previously expected to be released in March, but this date may be pushed back given the recent federal government shutdown. Negotiations between acting EPA Administrator Andrew Wheeler and California Air Resources Board Chair Mary Nichols continue, and one hopes that the Trump Administration will back down from this environmentally catastrophic and legally indefensible proposal. But if the final rule includes the waiver revocation as proposed, we believe such a move should be overturned in court for all the reasons we’ve outlined in today’s Issue Brief.